This fall, the Philadelphia Museum of Art will present an overview of Ronaldus Shamask’s unique multi-disciplinary approach to fashion, honed over a 35-year career. Ronaldus Shamask: Form, Fashion, Reflection explores the evolution of the designer’s creative process and includes clothing as well as life-sized “architectural” fashion drawings, dance costume sketches, and video clips of fashion shows and dance performances. It also focuses upon his collaborations with fellow artists working in a variety of fields. The exhibition includes iconic garments from his collections and contemporary designs, presented here for the first time. This exhibition showcases Shamask’s women’s wear collections, which are known for their clean lines and focus on cut, construction, color, and the finest textiles. With a background in stage design and interior architecture, Shamask finds infinite form-giving possibilities by eliminating all but the essential elements needed to animate his creations. Since he presented his first couture collection in 1979 in New York, Shamask’s designs have been shaped by architecture as well as traditional Japanese clothing and crafts, including origami, the art of paper folding. Hakama Evening Overall (1979, version 2012) reinterprets the formal garments traditionally worn by Samurai warriors with an unexpected jolt of color inspired by Piet Mondrian’s grid paintings as well as the 17th century Spanish painter Francisco de Zubarán. When unfolded, the dramatic Four Point Ensemble (1982) takes the form of a traditional Japanese theater banner. Shamask’s architectural inspiration can be seen in Spiral Jacket (1981), cut from one piece of fabric incorporating a continuously curving seam that mimics a lemon peel. Instead of the free-hand sketches common to many designers, Shamask’s early designs were drawn like architectural renderings to scale on graph paper prior to their construction. This method can be seen in Drawing for Pleated Dress (1979), shown in the exhibition along with Pleated Dress and Handbag Jacket (1979), a garment constructed of precisely folded pleats anchored by top stitching, topped by a long sleeveless jacket with integral pockets. In addition to considering how his designs interact with the body, Shamask enters into provocative dialogue with the work of other artists. Throughout his career, Shamask has been drawn to collaborative projects with artists who share his vision and multi-disciplinary approach in their respective fields. In Suspension Dress (1979, version 1991, 2012), Shamask used a cast silver necklace by Michele Oka Doner as a counterweight to a draped square of linen, which falls into a handkerchief hem in the back. Evening Dress (1998, version 2012) and Two Piece Halter Dress (1998, version 2012) represent the influence of Jennifer Bartlett’s post-minimalist work with color and grid. Shamask showed his Spring 1999 collection at Bartlett’s Greenwich Village studio (November 1998), which offered a striking dialogue with the artist’s paintings and prints. Shamask was also influenced by music and dance, which he explored both solo (as seen in Cello Jacket (1981), which boldly articulates the instrument’s curve) and in conjunction with others. His collaborations with choreographers Lucinda Childs and Mikhail Baryshnikov are reflected in an illuminating series of sketches in a loose, gestural hand that shows a lyrical side of the designer’s work. Shamask partnered with Childs to design costumes for eight dances between 1983 and 1999. Costume Design for “Portraits in Reflection” (1986, with sets by Robert Mapplethorpe) is a black and white abstract rendering of Childs in motion. Sketches for Dance Costumes for Chamber Symphony (1994) are, at their essence, geometric shapes overlaid with a grid, later reflected in his 1999 collection inspired by Bartlett. Costume Sketches for The Good Army (1994) for Baryshnikov’s White Oak Dance Project depict “non-costumes,” a sporty street wear look using pieced, asymmetrically cut windbreaker fabric, cardigans, denim, and flannel. At first glance the costumes appear to be shirts tied around the waist, but when the dancers execute their ballet movements, the wraps become formal draped skirts. 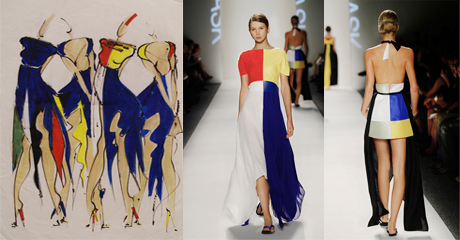 Shamask reinterpreted these costumes in his Spring/Summer 2012 collection, as seen in Mondrian Meets Superman Long Dress, in which the designerused fine linen, silk, leather, and suede to create a simple, elegant garment. About the artist: Born in Amsterdam in 1945, Shamask immigrated to Australia as a teenager and moved to London at age 21 to paint and work as a fashion illustrator for The Times and The Observer. In 1972 he relocated to the United States, where he worked as a stage designer for ballet and theatre and as an interior architect. In 1979 he launched his fashion business with Murray Moss and the two remained partners until 1990. In 1996 he launched his own company, SHAMASK. Over his career he has received many accolades including the Coty American Fashion Critics Award for Women’s Wear in 1981 and Outstanding Men’s Designer from the Council of Fashion Designers of America in 1987. In 1982, Shamask was included in the landmark exhibition Intimate Architecture: Contemporary Clothing Design at the Massachusetts Institute of Technology. His work has been featured in numerous museum exhibitions including the Metropolitan Museum of Art, the Guggenheim Museum, the Kyoto Costume Institute, and The Fashion Institute of Technology. Only rarely are his collections shown on the runway; Shamask focuses on a select client base including a number of luxury retailers. About the Costume and Textiles Collection: Since its founding as an outgrowth of the 1876 Philadelphia Centennial Exhibition, the Philadelphia Museum of Art has amassed one of the largest and most comprehensive collections of costumes and textiles in the world (nearly 30,000 works), which ranges in scope from ancient textile fragments to collections of Chinese costume from the Han Dynasty in the 8th century to the innovations of Elsa Schiaparelli in the 20th century, Grace Kelly’s wedding dress, avant garde menswear, as well as recent works by Ronaldus Shamask and Philadelphia-born Ralph Rucci. The collection’s varied and often surprising strengths have inspired and formed the basis for innovative exhibitions such as Community Fabric: African American Quilts and Folk Art (1994); Best Dressed: 50 Years of Style (1997-1998); Shocking! The Art and Fashion of Elsa Schiaparelli (2003); and Roberto Capucci: Art into Fashion (2011). The Department of Costume and Textiles, first organized in 1893, also has works on display from the collection in rotating yearly exhibitions in the Costume and Textiles Study Gallery on the second floor of the Perelman Building, and in Gallery 271 in the Main Building. The exhibitions currently on view are Great Coats: Women’s Outerwear from the Collection (Study Gallery) and Scottish Samplers from the Whitman Sampler Collection (Gallery 271).